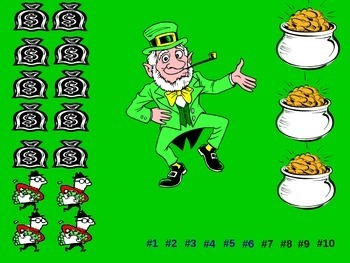 St. Patrick's Day Powerpoint Game "Lucky Leprechaun"
Tired of Jeopardy? This is a fun PPT game for any subject and any grade. Simply add your 10 questions and answers to the slides. Press F5 to play. I usually play it as one whole class against another whole class. Pick a student to choose one of the 3 gold pots. Click on the pot and they students start with that amount of money. At any point in the game, they can start over by choosing a different pot. 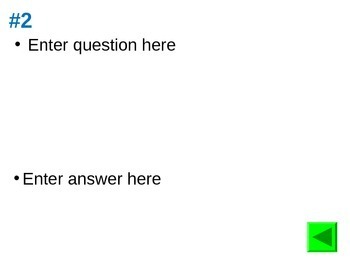 Choose a question, click for the answer to reveal, and then go back to the main screen. If the student gets the answer right, they choose a money bag and get the points underneath. If they get it wrong, click on a "robber" who will take points away from you. Lots of fun!